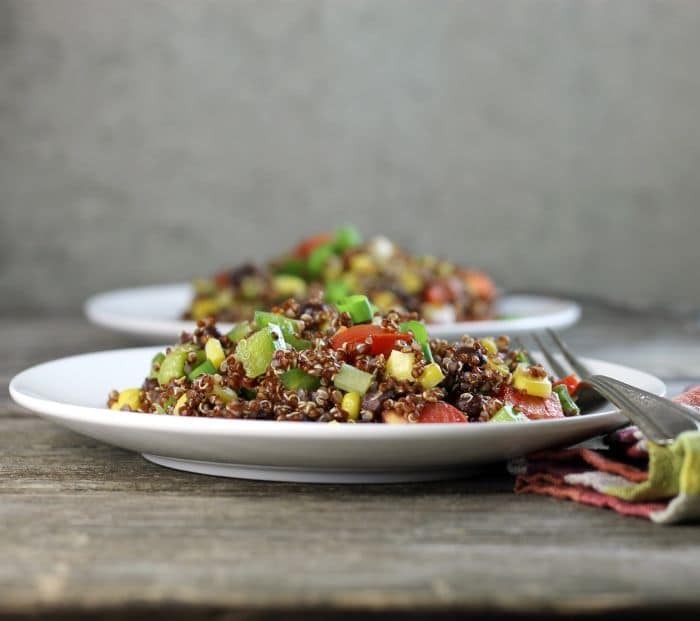 Black bean quinoa salad tossed with a lime vinaigrette will keep you filled up and satisfied. A delicious way to get your protein and fiber. I have been feeling a little stressed of late. Not sure if I have mentioned this, by our daughter is getting married in October. I had made a promise to myself that I would be 20 pounds lighter by the time I went dress shopping. Well, I have been trying to do this for the past few months and, to tell the truth, I have had very little success. There is so much going on this summer it has been really hard to keep any regime of eating healthy. And there is finding time to work out, work on my blog, and working a full-time job. Do you see where the stress is coming from? A whole lot of stress! But this black bean quinoa salad has been a great way to help me with the promise of losing weight. I have been taking it for my lunch and I find it really fills me up and feel satisfied for hours. I love the quinoa, black beans, and all the veggies that are added to this salad. The lime vinaigrette completes the delicious salad. Plus let me tell you how easy it is to make. Once the quinoa is cooked add the chopped veggies, rinse and add the black beans, mix in the vinaigrette and you are done. Looking for something healthy and delicious? Give quinoa a try, you might find that you love it. 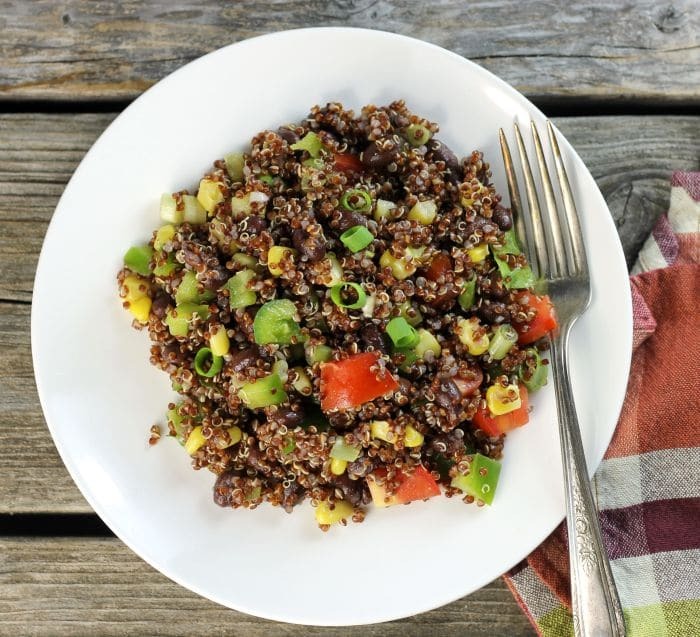 I was inspired by this recipe here for my black bean quinoa salad. Cook the quinoa according to the direction on the package. Prepare the vegetables. Cut the tomatoes and the green pepper into small pieces. Slice the green onions. For the dressing combine the cumin, oregano, and garlic. Mix in the lime juice. Slowly whisk in the olive oil. Combine the cooked quinoa with the vegetables. Toss the salad with the lime vinaigrette. Such a healthy, delicious and protein rich salad! I wouldn’t even miss the meat here. Beautiful salad Dawn, love all the fresh veggies. Weddings are always a little stressful, wish you the best in planning and dress buying. 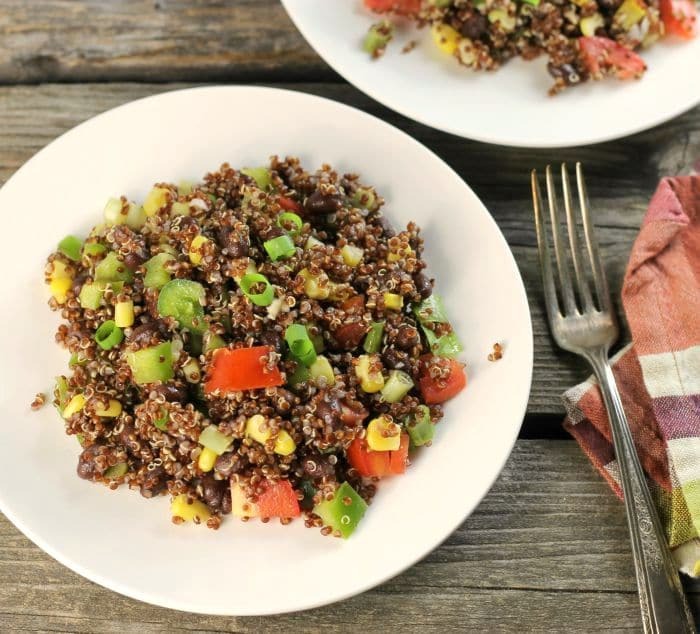 This looks delicious Dawn…what a great meal…and yes, I love the combination of quinoa and black beans…simple and so tasty! This looks so delicious! I am loving all of the food combinations here! It sounds great! Have a great weekend Dawn! I need to make another quinoa salad soon! Yours looks wonderful—love all the veggies! Congrats on the upcoming wedding. So much fun!!! Oh gosh, losing weight really is difficult! And it’s even more difficult when you like to cook and play around in the kitchen. 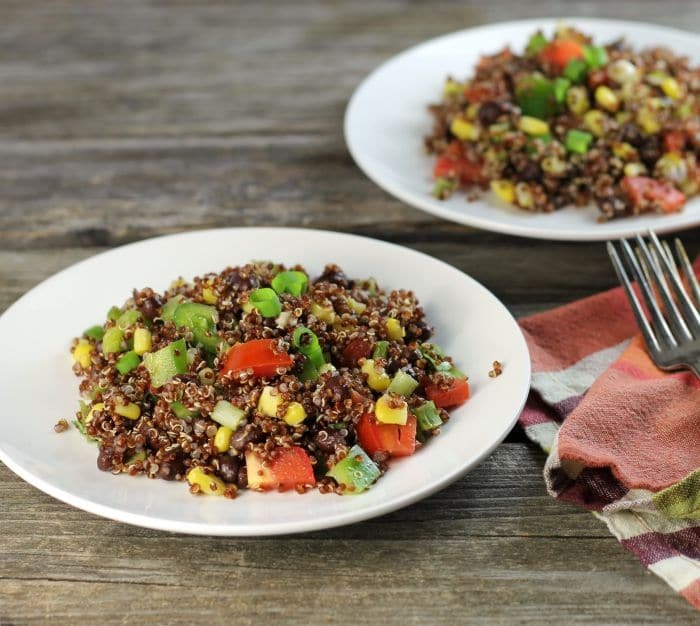 But this quinoa salad sounds healthy and amazing! I need to give this one a shot for weekday lunches. 🙂 Good luck, Dawn, you can do it!! I would love this for lunch every day Dawn! Colorful and delicious! How exciting that your daughter is getting married – don’t sweat the weight too much you’ll look beautiful no matter what.